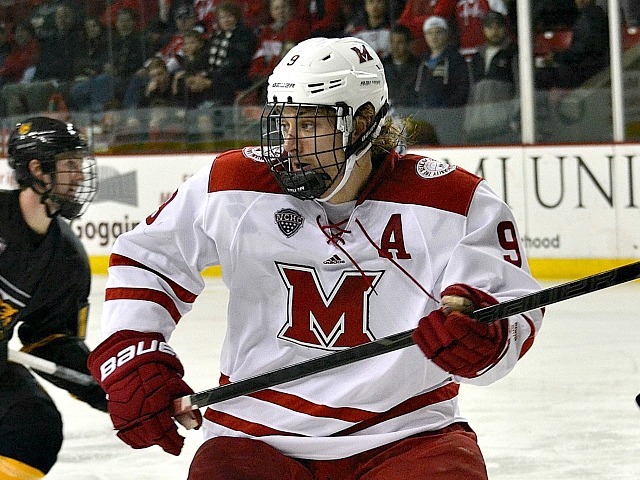 The highlights from Miami’s 6-1 win over Western Ontario in the RedHawks’ lone exhibition on Saturday were impressive. And while, disappointingly, getting to this game was not a possibility on this end (Mrs. Rednblackhawks and I were vacationing in Alberta), there typically is not a ton to take out of preseason games. But there are a few facts and observations from the highlights, box score and the embedded spies BoB sent to the game that are worthy of prose here as Miami heads into opening weekend. – Fs Zach LaValle and Justin Greenberg did not play. Greenberg has played in 68 games the past two seasons and is turning into a solid penalty killer. LaValle went 20-41-61 with NAHL Janesville last season. The competition at forward will be great this season, and two forwards and one defenseman will have to sit each night, so we’ll see how coach Enrico Blasi handles his scratches moving forward. Third goalie Evan McCarthy didn’t get into the game either, but that’s not unexpected – the freshman will be a more of a factor for playing time in 2016-17. – Defensemen scored three of the six goals, and another was by swingman Michael Mooney, who was playing forward at the time. The entire team generated just 17 goals from its blueline corps in 2014-15. Trend or the result of a weak opponent? Hopefully the former. Sophomore Scott Dornbrock found the net once and Louie Belpedio banged home the other two. Both had four shots and senior Matthew Caito tallied three. More shots by defensemen will keep opponents’ defenders honest, so it would be great if they continued to put the puck on net. – By all accounts, the standouts from this game were junior Anthony Louis, sophomore Louie Belpedio and freshman Jack Roslovic. One Tweet I received from someone in attendance said simply “Roslovic is a monster”. This summer, assistant coach Nick Petraglia raved about the former two and the expectations on them this season, and they delivered in this game. Belpedio scored twice, Louis netted a goal and Roslovic set up a pair. – Sean Kuraly finished with three assists. Again, trying not to read too much into an exhibition against a CIS school, but a lot of focus will be placed on Kuraly by opponents with Czarnik/Coleman/Barber et al out of the picture. Kuraly definitely brought his passing stick in this game after ended 2014-15 with just 10 helpers to complement his 19 goals. He can alleviate the defensive pressure on him by creating chances for others this season via the passing game. – Freshman Josh Melnick scored. Maybe this is just a personal thing, but it makes me feel good to see a rookie score in the exhibition(s) because that has to help his confidence. D-I college, especially at an elite program like Miami, is a major step up from U.S. juniors, and scoring in a first game has to make life easier on a player moving forward. Here is the conclusion of that conversation. BoB: Another forward coming in is Ryan Siroky (Sir-OH-key). BoB saw him a couple of seasons ago with Green Bay and he looked like he had some talent but was 17 and raw at that point. He went 14-19-33 last year, including 1-7-8 in the playoffs after being traded to Muskegon. PETRAGLIA: High-character kid, power forward, responsible. In the last year, year and a half, he has become very versatile in terms of being able to play different positions up front. He was recruited as a winger but was moved around in different teams’ lineups and learned how to play center, so that versatility is very important for us to be able to use him in different spots. He’s a kid that works hard, he has the ability to score goals – he has a little bit of offense to him, has a scoring touch in tight. He’s a complete player that is responsible and can contribute meaningful minutes to our team. BoB: Next would be Zach LaValle (la-VAL). LaValle had a big year in the NAHL, going 20-41-61 for Janesville. PETRAGLIA: He was a very successful three-sport, all-state athlete in Minnesota. I would say his strengths are his hockey sense and his playmaking. He had a really good year leading the team in scoring, and (Janesville) set a league record for wins and points and they ran away with the league, and he kind of league the way offensively. He’s a smart, playmaking forward, and he’s a guy that can probably play center and wing for us as well. BoB: Another player who was a big points producer in juniors is Josh Melnick. At 5-feet-7 and with a line of 14-48-62 with Youngstown of the USHL, that looks like the scoring line of a playmaking center. PETRAGLIA: Yes, that’s exactly what he is. He is one of the best passers that we could’ve found. He knows how to set the table, he knows how to run a power play, and again, hockey sense. Really, really smart, really smart and reliable, he can fly, he can make plays at high speed. He could probably shoot the puck a little bit more, but he really knows how to step guys up and make plays and produce offense, and he’ll be a guy that we think will transition very nicely into college hockey and make an immediate impact. BoB: Kiefer Sherwood. Here’s a guy that absolutely blew up last season. He scored 29 goals and set up 27 more in his third season with Youngstown. What is your impression of him? PETRAGLIA: He did (score a lot) in midgets and that’s where we recruited him from. Again, looking at what we’re replacing and what we’re bringing in, you lose a shot like Riley Barber – and by no means am I expecting Kiefer to come in and score 20 goals, it could happen but you don’t want to put that kind of pressure on a kid – this is a kid that can just shoot the puck and score goals. His one-timer is incredible. He’s got a really quick release, a hard and heavy shot, he can really skate. So when you look at the list of guys we’re bringing in, we’ve mentioned a few playmakers, this would be a goal scorer, a guy that can score and get up and down the ice and make a difference. 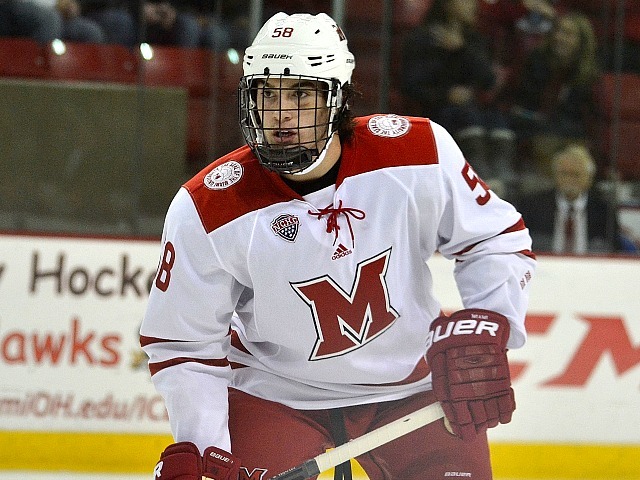 BoB: The final forward is a University of Maine transfer, Ryan Lomberg. He played two seasons with the Black Bears, going 18-14-32 in 66 games and sat out last season, joining Youngstown where he went 24-19-43. He will be a junior this year, and he did have an off-ice incident that led to his departure from Maine. Can you talk about bringing in a player with two years of collegiate experience on a team that lost a lot of forward talent? NOTE: Lomberg pled guilty to a disorderly conduct charge last summer stemming from a fight several months prior, for which he was originally charged with assault. PETRAGLIA: He’s a kid very similar to Blake Coleman. Difficult to play against, can play in all situations. Very, very gritty and hard-nosed, can score, can make plays, but he’s a player that the other team notices and they don’t want him on the ice. And he’s an outstanding kid. Had a situation at Maine that was obviously tough for him to deal with but we can definitely speak to his character and say that he’s a really good person that’s learned from his mistakes and deserves a second chance. Still some eligibility issues with the NCAA in regards to his transfer, so we’re not quite sure if he’s going to be ready for us in the first half or if we’re going to have to wait until January. If we have to wait until January, we’ll get through it and he’ll be a big part of our team whenever the NCAA says that it’s OK.
BoB: So, worst-case scenario, he can come in this January as a junior and still play his entire senior season in 2016-17? PETRAGLIA: That’s correct. Worst-case scenario…he can play (vs.) RPI, Jan. 2. BoB: With all of the forward spots that are open from last season (7 – Czarik, Coleman, Murphy, Wideman, Mullin, Barber, Doherty), the spots are there for these incoming players to win starting jobs right away. Is that accurate? PETRAGLIA: Yeah, and that’s how we’ve always recruited. We want to bring in guys to fill roles and we bring them in when they’re ready to contribute. No different than when Austin Czarnik came in, Austin Czarnik replaced Carter Camper…and Austin Czarnik was our leading scorer and No. 1 center for four years. And now Austin’s gone. (At center), Sean (Kuraly) coming back, and what he brings to our team and the impact he’s going to have on the ice is huge. I don’t want to say who our No. 1 center is going to be, who knows? You could argue whomever. But Sean’s going to be a huge piece of our puzzle, and Jack replaces Austin and kind of fills that role. So you can see the different skill sets and the different elements that the (incoming) guys bring to the table. They’re brought here for a reason and hopefully they’re ready. BoB: You mentioned Sean Kuraly a couple of times. He takes over the captaincy from Czarnik. Fans can see how hard he works and much of a force he’s become since coming to Oxford, but can you talk about the type of leader he is, which is something many people don’t see? PETRAGLIA: He just gets it. First of all, he is the poster child of how to carry yourself, the perfect example of a human being in terms of humility, caring for other people, caring for his teammates, his selflessness. He’s so passionate and he works so hard. I think that’s one thing that people who don’t know Sean Kuraly that come to watch us play – I’m sure that if you’re watching that, oh, look at Sean Kuraly. Look how hard that kid works. He brings his best every single shift, and it’s not just on the ice. He brings his best in the classroom, he brings his best in terms of his attention span in a meeting, when he’s talking to his friends and his teammates. More than anything, he is respected by every single person in our program. If you were to take a poll, I’ll bet every single person in our program would vote him as our captain. It would probably be unanimous. BoB: You have one defenseman coming in, who is Grant Hutton. He has bounced between the NAHL and the USHL and had an excellent playoff year with that tremendous Janesville team. He’s 6-feet-3, so can you talk about how he fits in to this team? PETRAGLIA: Grant is a kid that’s built off of work ethic. He’s very strong, very well conditioned, great athlete. Obviously he has some size, and one thing about him – he can shoot the puck and he has a little bit of offense – but more than anything he takes great pride in playing D and shutting down the other team and keeping the puck out of his own net. He’s a player that hates to get scored on more than anybody I’ve ever met. It really bugs him, and obviously that’s a very important attribute to have on your team is a guy that really takes pride in taking care of his own end and defending, and that’s what Grant Hutton does. Another kid (with) great character from Indy, just down the road, so a semi-local kid that grew up loving Miami. (He’s) excited to be here and we’re excited to have him. BoB: With Ben Paulides graduating and Colin Sullivan, who played very well when he was healthy last season, in the mix, it looks like there are going to be battles for those final couple of defenseman spots in the lineup each night. PETRAGLIA: So with Mooney, you mentioned having a roster of 25, it gives us comfort knowing we have a guy like him that can play both positions as necessary based on the way things are going. But you mentioned the competition and that’s absolutely true, competition makes everybody better, it makes our team better, and we’re really happy with the makeup of our D-corps and the different elements and the competition that’s back there. We thought the guys did a real good job last year, playing both ends and taking care of the D-corps, so to have the majority of them back, and losing Ben Paulides, who did a good job for us. Grant comes in and has a similar skill set, defends in the same way that Benny did in terms of being a defensive defenseman, so we’re hoping for our D-corps to once again have a solid year, be a big part of our team. BoB: Miami is bringing in another goalie in Evan McCarthy. He has been decent in the NAHL the past two seasons, so can you talk about him coming in with two other established goalies already with the RedHawks? PETRAGLIA: So Evan’s coming into a situation where we obviously have two seniors who have played every minute for the last three years, and we’re going to expect a lot out of them, so he’s going to have an opportunity to compete and learn and be a part of that for a year. A year from now we’re going to expect Evan to step up and compete for a spot. We have a kid coming in who I’m not allowed to talk about until he signs his (Letter of Intent), but just having the competition that position, Evan’s going to have the opportunity to compete for playing time for four years. This year will be a little tougher for him because he’s got two seniors (in front of him), but after that it should be a good opportunity for him to battle it out. He’s a good that is extremely bright, very, very good student – he was valedictorian of his high school in Colorado – has a great work ethic. He has good size, he fills the net well, has a good skill set, so it will be a really good opportunity for him to learn the college game and adapt to this level of play and just get used to it before Ryan (McKay) and Jay (Williams) both graduate. I’ve got one other thing to say, because it’s really important: Anthony Louis and Louie Belpedio. I would expect both of them to take huge steps this year. They were both great for us last year, but in terms of developing into elite college players, I think both of those guys are ready to take that step. When you talk about the guys that are leaving and trying to fill voids, both of those guys are totally capable of stepping up, and I wouldn’t be surprised to see Anthony Louis light it up. John Lachmann writes for WCPO.com, the Northern Kentucky Tribune, Tristatefootball.com and GetSportsInfo.com. You can follow him at @rednblackhawks. Nick Petraglia is entering his sixth season as an assistant coach at Miami, but he has been around the program since he was 18. 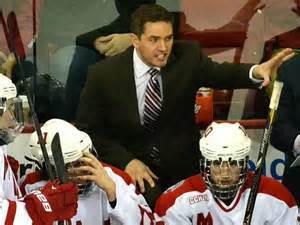 He was a goalie for the RedHawks in 2000-01 and 2001-02 under current head coach Enrico Blasi, and was a volunteer assistant coach for three seasons before becoming the director of hockey operations at Miami. 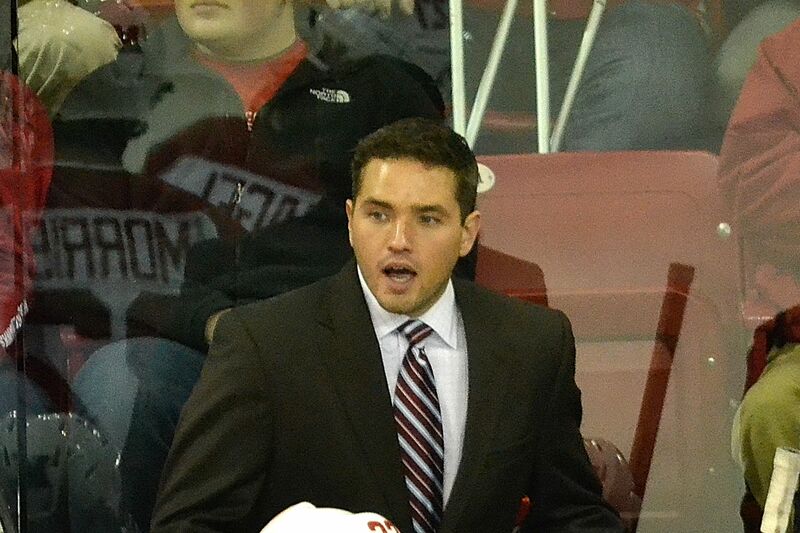 Two of his main current responsibilities for the RedHawks are working with the goalies and serving as a recruiting co-coordinator. Because he watches the incoming players extensively before they come to Oxford, the Blog of Brotherhood talked to him about how the newest crops of RedHawks and the state of the roster, as well as other off-season topics. BoB: So what is the coaching staff doing at this point to prepare for this fall? PETRAGLIA: Preparation started probably a couple of weeks after the Frozen Four last year. Really, just recapping last season, seeing what the makeup of our team was going to look like, establishing a new identity, leadership, addressing areas that we needed to improve. That all occurred at the end of last season, and then when the guys were around for summer session, they put in a lot of hard work, just getting off on the right foot in terms of training and their summer preparation. Right now, we’re just kind of recapping those topics that we covered in the spring, and then the next two weeks we’ll spend a lot of time meeting and planning our preseason in terms of what our practice is going to look like, what our schedule is going to look like, making sure we’re making the most of our time because we have to be pretty efficient with the NCAA restrictions that are in place in the preseason in terms of hours. So really at this point it’s just putting the plan in place and making sure we’re ready to go and we’re prepared to we can execute that plan when the guys are here. BoB: Miami lost a lot of really good forwards from last season (Austin Czarnik, Blake Coleman, Riley Barber, Cody Murphy, Alex Wideman). Is the biggest concern heading into 2015-16 this team’s ability to put the puck in the net? PETRAGLIA: I wouldn’t call it a concern, just part of our job in recruiting is to know what we’re losing and to replace it. So while obviously a few players that have those abilities have left, we feel like we’ve replaced it with guys who can fill those roles. Obviously with freshmen, there’s going to be a natural learning curve, but we’re really excited about what we have coming in with some of the new guys to carry to load. And then on top of that, as guys get older and new opportunities are available, you always look for some returning players to step up and take up their role and fill some of that void left by graduating seniors or in this case even Riley Barber, who left a year early. I think we have a lot of firepower, we have good balance – skill and speed – and hopefully that will translate to production. I wouldn’t say we’re concerned but it’s definitely something we’re going to have to find the right chemistry and work at, make sure we’re living up to the standards that we’ve set. BoB: Is off-season at Miami easier for you and the other hockey coaches because you’ve been together so long? Coach Enrico Blasi is entering his 17th season, Coach Brekke has been there for almost a decade and you’ve been with the program since you were a teenager and are in your sixth season in your current role as an assistant. PETRAGLIA: I think as a the years go on we become more and more cohesive as a staff, and I would also say that as a program, that includes our relationships between the staff and the players as well. Just having everybody on the same page, knowing what our standards are and buying in and working toward the same goal. So our summer discussions as a staff and the planning that’s in place: I think there’s a lot of chemistry in that area. We definitely have discussions where we’re trying to figure things out and think of new ways to do things, and we’re always trying to get better, but I would say that the quality of our relationships and where we’re all at personally really helps with that because we really are one big family, and it’s fun to show up every day and work with people that you care about and that you love and that you can really get along with and not only have a great relationship but a productive one where you can talk things out even when things are tough, and talk things out and come to an agreement as one. BoB: In looking at your roster, last year at this time you had 28 players. Right now there are 25 listed, which is the smallest roster I can remember this team having. A couple of guys aren’t coming back that you probably expected to see here this fall, but how do you feel about having list 25 players on the roster right now? PETRAGLIA: We feel OK with it. We were a little surprised about Jimmy Mullin moving on. Obviously he graduated, but (he) has an opportunity at Minnesota State…so that would’ve been 26. But 25, we feel good about. We feel really good about our senior class. Outstanding group of people that have been through a bunch of good times but some tough times as well, so they’ve seen both sides of it, and the leadership starting with Sean Kuraly, who’s going to be a tremendous captain for every reason you can list. Not only that but his support group is really, really good. The character that’s in that senior class is really going to lead the way for our team and sets the bar high for us. So we really couldn’t be more excited about that senior class taking charge of this team. BoB: Two defensemen that were on the roster last year at this time, Matt Joyaux and Trevor Hamilton, decided mid-season to pursue opportunities with other teams. Nothing against them, they did what they had to do to further their hockey careers, but a player like Garrett Kennedy a few years ago was willing to not dress for two years before getting his shot on the ice and ended up being a solid contributor his final two seasons. With college hockey becoming more competitive and more of a business than ever, do you envision this current scenario is going to become more of a reality or do you feel last season was an aberration? PETRAGLIA: I really hope that’s not the reality – that’s a really tough question to answer because everything is a case-by-case basis. In those situations, it was a tough situation for both players, they found themselves out of the lineup more than they would like and felt that they would have better opportunities to play more elsewhere, and that was the reason for leaving. I think they both really did love Miami and enjoyed the overall experience, but it came down to playing opportunity. It’s disappointing to see that happen because there are other examples where players find themselves in that situation and they work hard and they work themselves out of it and find themselves in the lineup every single game, and that’s what you would like to see because unfortunately someone’s got to sit out each night, not everybody can play. So I hope that’s not the reality, but it is the nature of the business when you’re trying to put yourself in a position to succeed and play as much as possible. Sometimes it just doesn’t work out for whatever reason and people move on. That was tough, in the middle of the season, for that to happen, but both kids handled it well, left on good terms in terms of not having any animosity, it was handled rather professionally, and we all got through it. BoB: Overall, looking at the dynamic of the team, you lost a 5-feet-6 and a 5-feet-7 guy and are only bringing in one smaller player. The lone incoming defenseman is 6-feet-3. So it looks like you’re going to have a little more size this season. PETRAGLIA: I know going back a year ago, after 2013-14, we felt like we needed to get bigger. We added Lemirande, Dornbrook, Sullivan. We felt like we needed that size and strength. And at this point we feel like we’ve got a pretty balanced lineup where I don’t think size is an issue. Naturally, we’re going to have some smaller players that bring certain skill sets to the table. The size of this year’s class is probably average to normal. BoB: The incoming player who has commanded the most hype is forward Jack Roslovic. He was picked in the first round, 25th overall by the Winnipeg Jets this summer. 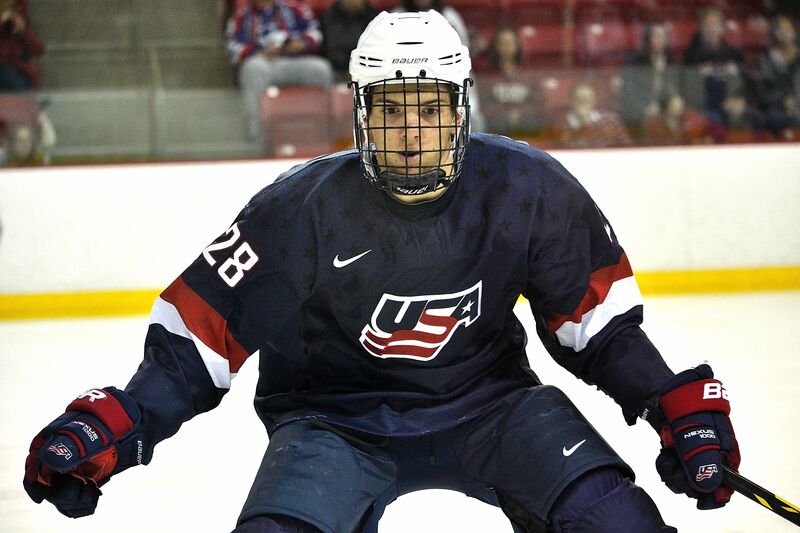 In 25 games for the U.S. National Development Team, he had 11 goals and 27 assists, plus he went 6-5-11 in seven games for the U.S. Under-18 Team in its gold medal effort. He played in an exhibition at Cady Arena last season, and BoB saw him again in Ann Arbor last winter and his talent level looks off the charts. Especially with all of the key forward losses, the RedHawks are going to need someone who can jump in and contribute right away. Can you talk about him and what he brings to Miami? PETRAGLIA: Jack is a special player. Obviously there’s going to be a lot of expectation and a lot of pressure just because of where he was drafted, where he’s coming from. He’s very highly touted. But the one thing I will say about Jack is he’s very, very grounded. For all that’s been through and what he experienced this summer, he’s got a really good head on his shoulders. He can do everything. He’s got decent size, he’s strong on his skates, his playmaking and offensive instincts are incredible. Very, very good hockey sense. He can do it all, and he’s one of those guys that we’re going to expect to be ready right away. Obviously there will be a little bit of a transition, but he’s already played in some college games (in exhibitions), he’s played in big-time environments, and we’re going to lean on him pretty heavily to produce right away, and we don’t see him having any big issues other than normal growing pains. Check back on Wednesday for Part II and the conclusion of our conversation, as Petraglia dissects the rest of the incoming recruits and talks about the players he expects to take major steps forward this fall.